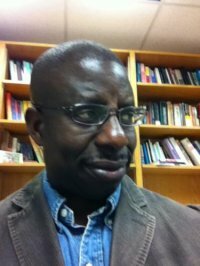 Ogaga Ifowodo, poet and writer, teaches poetry and literature in English at Texas State University, San Marcos, USA. He holds the Master of Fine Art (MFA) in poetry and Ph.D from Cornell University, New York. He studied law at the University of Benin and worked for eight years as a rights activist with Nigeria’s premier non-governmental rights group, the Civil Liberties Organisation (CLO). Between 1997 and1998, he was held in preventive detention for six months under the military dictatorship of General Sani Abacha. A memoir of his prison experience, excerpts from which have been featured in Gathering Seaweed: African Prison Writing (Heinemann), New Writing 14 (Granta), Nigeria’s Vanguard newspaper, and African Writing—http://www.african-writing.com/aug/ogaga.htm—is in progress. Ifowodo has published three prize-winning books of poetry: Homeland and Other Poems, Madiba, and The Oil Lamp. His poems have been translated into German, Dutch and Romanian and have also been widely published in anthologies and magazines, including Voices from all Over: Poems with Notes and Activities (Oxford University Press, 2006), Step Into a World: A Global Anthology of the New Black Literature (John Wiley, 2000), The Times Literary Supplement, Poetry International, English in Africa, The Massachusetts Review. His debut fiction piece appears in AGNI. He is a recipient of the PEN USA Barbara Goldsmith Freedom-to-Write Award and of the New Word Award of Poets of All Nations based in the Netherlands. An honourary member of the PEN Centres of the USA, Germany and Canada, Ifowodo is also a fellow of the Iowa Writing Programme.